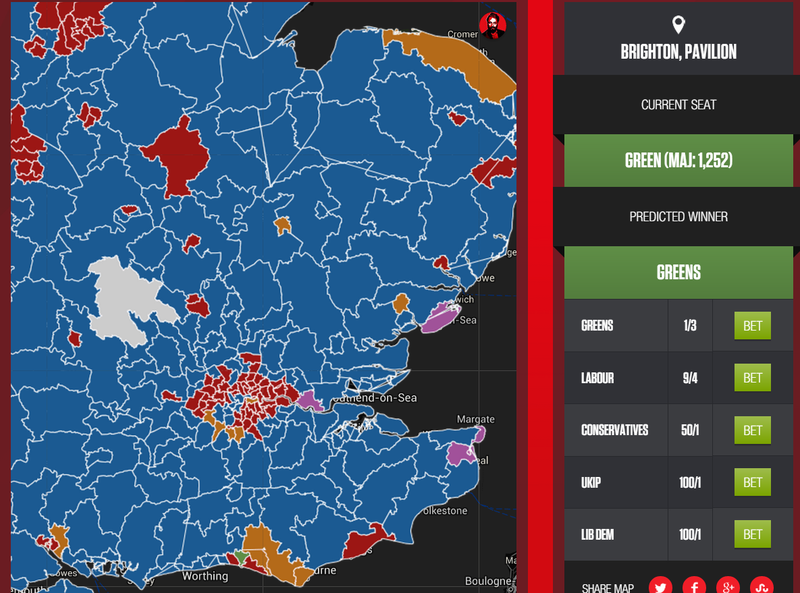 Ladbrokes have launched a live election forecaster and map. 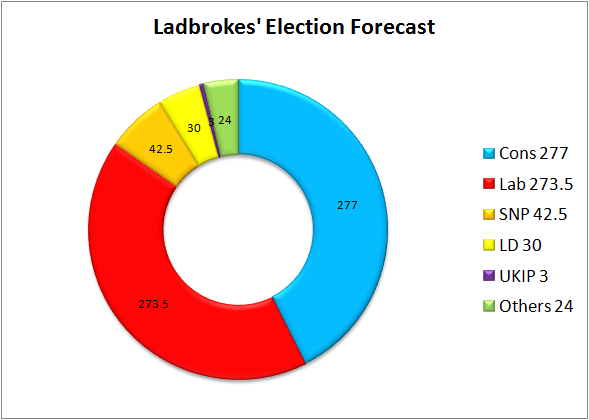 The forecast shows what would happen if the current favourite wins in each of the individual seat markets, and updates live every time the odds shift in any seat. Plus, we’ve also got a nice map where you can zoom in to any seat, see the latest odds, and have a bet if anything takes your fancy. 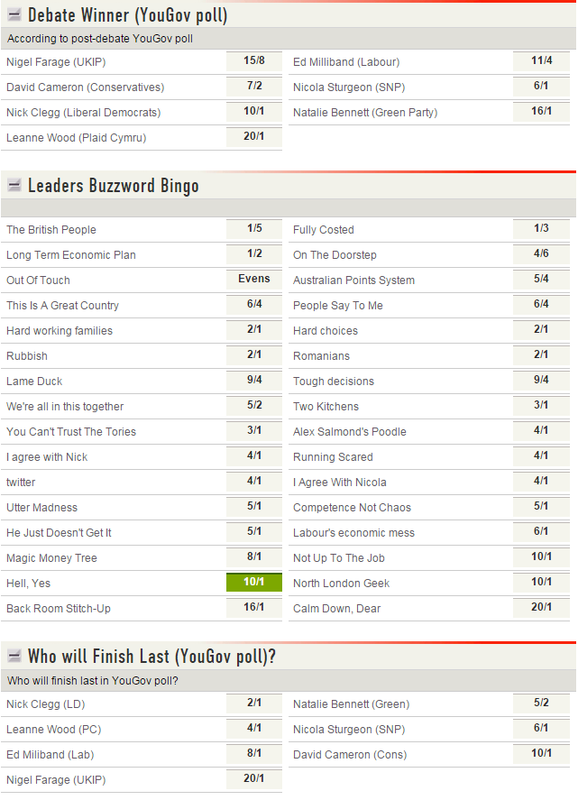 Why Nigel Farage is favourite and a run-down of the best Buzzword Bingo bets from Ladbrokes politics desk. Two top political betting tipsters both tipped the outsider to win on Thursday, Leanne Wood for Plaid Cymru. Mike Smithson of politicalbetting.com and Matthew Engel in the Racing Post both liked her chances at 50/1 and a flood of money has seen her odds come into 20/1. You can find the latest odds on our site, here. We’ll settle the winner as declared by YouGov’s snap debate poll on Thursday night. The tricky thing about backing Wood (or indeed Sturgeon) is guessing how likely it is that many English voters will pick one of the nationalists as the winner. 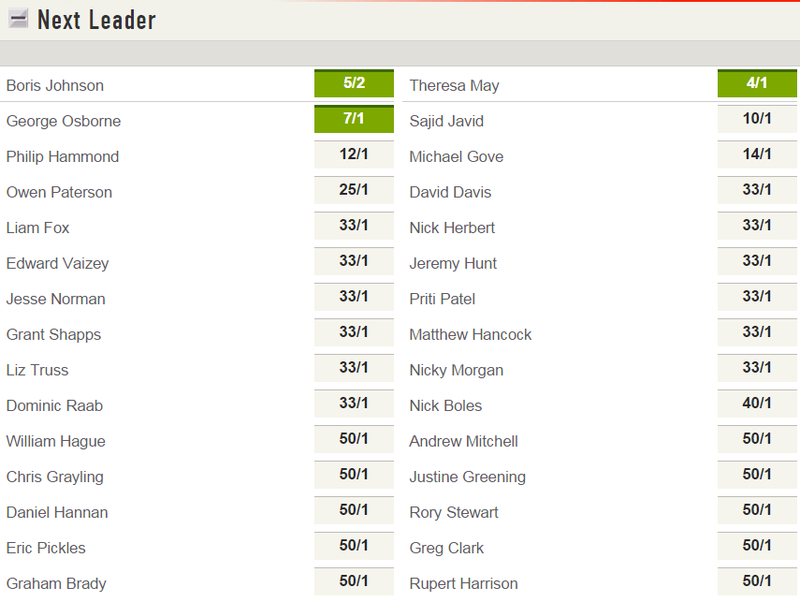 At the odds, I think I’d prefer to back Nicola Sturgeon. Farage remains favourite; he demolished Nick Clegg in their two pre-Euro Election debates and has a pretty easy hand to play. He’ll probably say that everyone else on stage is part of the cosy Westminster club, or pro-EU lefty elites, and he can easily make a very distinctive pitch that will appeal to a lot of viewers. 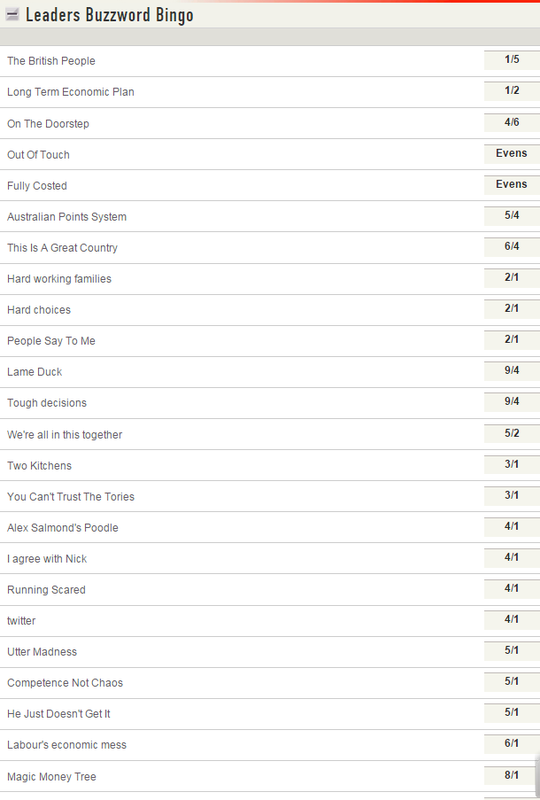 Ladbrokes have released their Buzzword Bingo odds today, featuring a few of the standard clichés. If anyone has any suggestions for others we can add to the list, post them here and we might add any good ones to the betting. Remember, one of the seven leaders has to mention the exact words or phrase for it to be a winner. I was lucky enough to meet Nate Silver today, in our shop in Bury market. He’s filming a Panorama programme about the election, which should be going out in the last week of April. That’s him with Richard Bacon, who’s doing the presenting. For a bit of fun, he had a tenner on the 4.35 at Kempton on a horse called Ninjago at 8/1. It won. He then re-invested his winnings on Wales to beat Israel in the football at 13/5. They won 3-0. £288 return from his original £10. Ladbrokes will be glad to see the back of him. 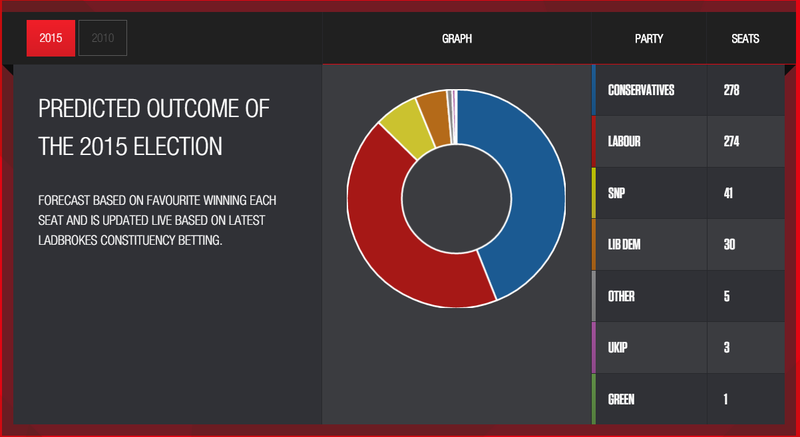 Cameron’s not going to serve a third term – headline news for the media but a resounding shrug of the shoulders from the betting markets. It’s hard to see how it will make any difference to the result in May. The odds on a 2020 departure haven’t altered; the betting had already worked out that it was unlikely he’ll even get that far. The main change we made was to cut the odds of a 2017 exit from 7/1 to 4/1. If he is still in place after this election, the next key point in his premiership is likely to be a 2017 EU Referendum. Win or lose, it looks like the perfect opportunity for him to step aside. Dave also nominated Osborne, May and Boris as possible successors. No surprise there, they were the front three in the betting anyway.